It tells an engaging story of gamblers, gangsters, showgirls, cops, and missionary workers in New York City during the 1930s, based on the short stories of Damon Runyon (as rewritten by Jo Swerling and Abe Burrows). The colorfully named characters (Harry the Horse, Nicely-Nicely) speak in picturesque language that combines vernacular street talk, formal speech (avoiding contractions, for instance), and unusual constructions, adding a humor of its own. After a fine overture by the orchestra, the show opens on a busy street scene in New York, the night skyline represented by white rectangles and strings of lights. There is an entrance to the subway and a newspaper stand. The assorted population of the city saunters by: sailors, high society women, showgirls, schoolgirls, and assorted characters of the city. Nicely-Nicely Johnson (Conner Lewis), Benny Southstreet (Gabriel Di Gennaro), and Rusty Charlie (Alexander Daly) open with “Fugue for the Tinhorns” (I Got the Horse Right Here), a creative three-part fugue on picking horses, and the cast members render it in a satisfyingly upbeat fashion, though they seem very young and innocent, not the seasoned gamblers they are portraying. Members of the Save-A-Soul Mission enter, introducing Sarah Brown (Rachel Marschke) and Arvide Abernathy (Michael Puglia), who are seeking souls to save. They are ignored by the gamblers, led by Nathan Detroit (Kyle Yampiro), who need a place for their floating crap game, safe from the prying eyes of Lt. Brannigan (Patrick J. Hagen). “The Oldest Established” was a rousing production with the men costumed in colorfully diverse suits and hats, and it ended with a dramatically held pose. Miss Adelaide (Brynn Lewallen), Nathan’s fiancée of 14 years, arrives with an anniversary present for him, the card reading, “Sugar is sweet, and so is jelly, put this belt around your belly.” Ms. Lewallen shines in this role, giving Miss Adelaide a sweet saintliness as well as a streetwise sensibility. Her songs, “A Bushel and a Peck” (with the Hot Box Girls gloriously feathered as chickens, at the nightclub where she performs), “Adelaide’s Lament,” “Take Back Your Mink,” “Sue Me” (with Mr. Yampiro) and “Marry the Man Today” (with Ms. Marschke) are always enjoyable and humorous. Her lament (“just from waiting around, for that plain little band of gold, a person can develop a cold”), sung to Nathan, is particularly endearing, and the duets are great fun. Sky Masterson (Brad Baron) arrives on the scene, and Nathan hopes to find a bet he cannot lose, in order to win from him the $1,000 he needs to pay for the use of the Biltmore Hotel Garage for an evening of crapshooting. This leads to Sky’s involvement with Sarah Brown, and the two fall hard for each other, though, of course, problems separate them for a time. Mr. Baron and Ms. Marschke blend harmoniously as they sing “I’ve Never Been In Love Before,” and Mr. Baron has a strong speaking and singing voice. Ms. Marschke’s speaking voice was much quieter, and it was sometimes hard to understand her, but she was exuberant in “If I Were A Bell” and her duos with Mr. Baron and Ms. Lewallen. “Sit Down, You’re Rockin’ the Boat,” led by Mr. Lewis, was terrific, full of vitality, as was the closing reprise of “Guys and Dolls” by the ensemble. Brandon Grimes is great as Big Jule, who brings his own dice to the game; he has removed the spots, but remembers where they were; and Amanda Forker plays General Matilda B. Cartwright with an appropriate mix of sternness and vulnerability to the charms of Sky. Stage direction for the show is by Michael Canestraro, and music direction is by Elizabeth Hastings. Heidi Kloes is the choreographer. 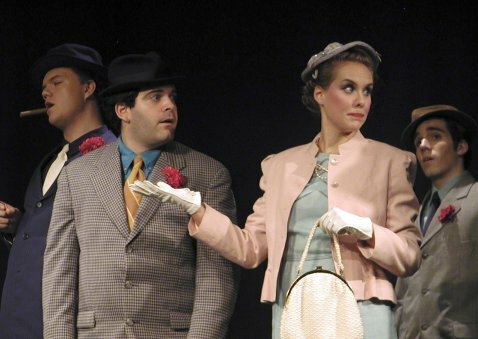 Costumes were designed by Kake Boucher, and the set design and technical direction are by Tim Boucher. The show continues through Saturday, July 24, at 8 PM. There is also a matinee Thursday, July 22, at 2 PM. Tickets are $30 and are available by calling 508-548-0668, or by visiting the CLOC box office, 58 Highfield Drive, in Falmouth. Box office hours are Monday through Saturday from 10 AM to 12:30 PM, 2 to 5 PM, and 7 to 9 PM. A special 100th anniversary production of “Naughty Marietta” opens Tuesday, July 27, and runs through Saturday, July 31. There will be a special lecture by Victor Herbert scholar Alyce Mott on “Victor Herbert’s Enduring Legacy” on Saturday, July 31, at 3 PM, at Highfield Hall in Falmouth. The talk will focus on Mr. Herbert’s influence on the American operetta. The event is free and open to the public. Refreshments will be served. Call the box office to reserve a seat. The following day, Sunday, August 1, is the annual CLOC Orchestra Soiree Concert, which takes place at 7:30 PM at the Cape Cod Conservatory, across the parking lot from Highfield Theatre. The event is free and open to the public.